The Smith & Wesson Model 500 is a double action/ single action revolver that is chambered for the .500 S&W magnum cartridge, which is the most powerful production revolver cartridge in the world*. It holds 5 rounds, and is built upon the “X Frame” that was designed for the .500 S&W cartridge. Available barrel lengths are 4″, 6.5″, 8 3/8″, and 10″, with muzzle compensators available from the factory. My Model 500 has a 6.5″ barrel with a compensator. Factory-produced .500 S&W ammunition is available in a variety of bullet weights, ranging from around 150 grains to over 500 grains. There are light weight “low recoil” load that lend themselves to more comfortable range practice, and quite hard-cast lead loads backed by heavy significant powder charge. My favorite ammo, the Barnes TSX copper hollow-point bullets loaded by Cor-bon, are available in this caliber. I bought my Model 500 on a Saturday morning from my local Gander Mountain (which did not have any .500 S&W magnum ammo in stock), and wanted to shoot it that day. After visiting 3 gun stores and calling another 2, I found what was probably the only gun store within 50 miles of my house that had any .500 S&W magnum ammo on hand. It was some of the most expensive ammo that I ever bought. My future ammo purchases for this revolver were all made online, which reduced the price of the ammo, but not to anywhere near the price I’m accustomed to paying for ammo for my .40 S&W pistols. 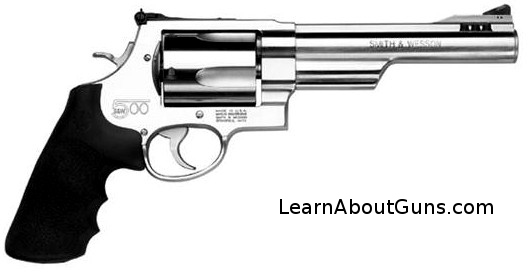 As I mentioned in my Model 610 Smith & Wesson revolver review, Smith & Wesson knows how to build a high quality revolver. I am just as happy with this Model 500 as I am with my Model 610. It has a sold feel and looks beautiful. Then again, it costs about $1,200, so good build quality should be expected. I find the X Frame Model 500 to be comfortable to hold. I have larger hands and find it to fit perfectly in my hand, and especially appreciate the rubber grip. Although I carry a pistol for self defense and rarely hold this revolver, I can say it is more comfortable in my hand than any pistol I have yet to hold. Loading and unloading it easy, and the cylinder release and action are smooth. Between myself, my wife, her brother, and a few employees of my firm who have gone to the range with me, about 50 rounds have been fired through my Model 500 revolver. That is really too few rounds to draw any meaningful conclusions, but I can say that I have no problems at all. The revolver is mechanically simple and well built to stand up to the recoil of the .500 S&W cartridge, so I expect it to work reliably. A muzzle compensator is offered from the factory. I have not fired a .500 S&W magnum without the compensator, but am happy that mine comes with one! The Model 500 is marketed as a revolver capable of taking any land game animal on the planet, and I believe it. But, as someone who has never been hunting, I don’t need this revolver to hunt. It is also an excellent self-defense gun against a bear attack. But, as someone who spend virtually no time in the woods, I don’t need it for that purpose either. Truth be told, I bought it because I just felt like buying a fun gun, and I’m glad to have it. On the day that I bought my Model 500, my wife and I went to the range. I fired 16 rounds and found it to be quite accurate for the first dozen shots. Afterwards, my hand began to get moderately sore and my accuracy was reduced. My wire fired two rounds, and then quit after making some remarks about the gun for having such recoil, as well as some remarks about me for calling the recoil “manageable.” To her credit, she put both of the round on the target paper and handling the recoil without excessive muzzle flip. About a week later, she stopped complaining about her hands hurting. I will never carry the Model 500 for self defense (unless I take up hunting in woods populated by grizzly bears as a hobby). It is not a practical home defense gun either. Instead, for me, the Model 500 is a somewhat unique and fun gun to own. I expect that it will occupy a space in my gun safe for 99.99% of its existence, coming out of the safe a couple times a year for a brief trip to the range. I imagine that many other .500 S&W magnum revolvers will be similarly treated, and that is probably what Smith & Wesson anticipated when they set out to create the “most powerful*” production revolver. I saw this gun used in that "Top Shot" televison series. Yes, it's the cool bad boy! I can't afford a fun gun right now, but I enjoyed reading your report! When I got my first pistol last year for home defense, I went with a .40 S&W primarily from reading the information on your site. Keep it up dude! Frankly, while this is one of the few handguns that will stop a grizzly (presuming you put the shot in the right place) its immense size and formidable recoil — even with the compensator — mean that you have to be tolerant of its handling qualities, practice with full power ammunition, and get good enough to reliably make the shot. A handheld cannon is useless if it spooks you so much you can't hit what you're aiming at, and for many folks a .44 Magnum will wind up being just as (or more) effective against bears. Bear (you'll pardon the expression) in mind also that if you keep your brains in gear and your eyes and ears open, you can avoid most wildland bear problems without having to shoot 'em. I agree with the reviewer that the 500 Smith is not suitable as a personal defense weapon, where your target is likely to be within 25 ft. It's amazing how easily you can miss at 25 ft if you're afraid of the gun, and anything much larger than a .38 or 9 mm +P at that range is likely to go right through your assailant and do unintended collateral damage. I live in grizz country and carry a 500 Smith with a 4″ compensated barrel loaded with 500 gn.XTPs and with a full house load it makes my 44 mag look like a sharecropper so its the gun I carry when in the woods.I love the 44mag but anyone comparing it to the 500 Smith is showing their naivety,big time.5 rounds of my ammo weighs exactly 1/2 a pound so its loaded for bear.